Released Feb-2011 (click here for full label image including side panels). Just like previous years (Verjus 2007, Verjus 2008, Verjus 2009), we have produced a tiny amount of verjus. Verjus is a french word from "ver" (green) and "jus" (juice). It is the juice squeezed from grapes that are harvested before they're ripe -- also refered to as a "green harvest". It can be used in cooking where you might otherwise use lemon juice or balsamic vinegar. Sometimes you'll find verjus labelled as "red" or "white", which indicates if the grapes it was made from are usually made into a red wine or white. Ours is 100% Melon de Bourgogne, a white winegrape. We use it in a simple salmon preparation along with a bit of dill and white pepper. We always have a bottle in the fridge and use a touch here and there all the time. 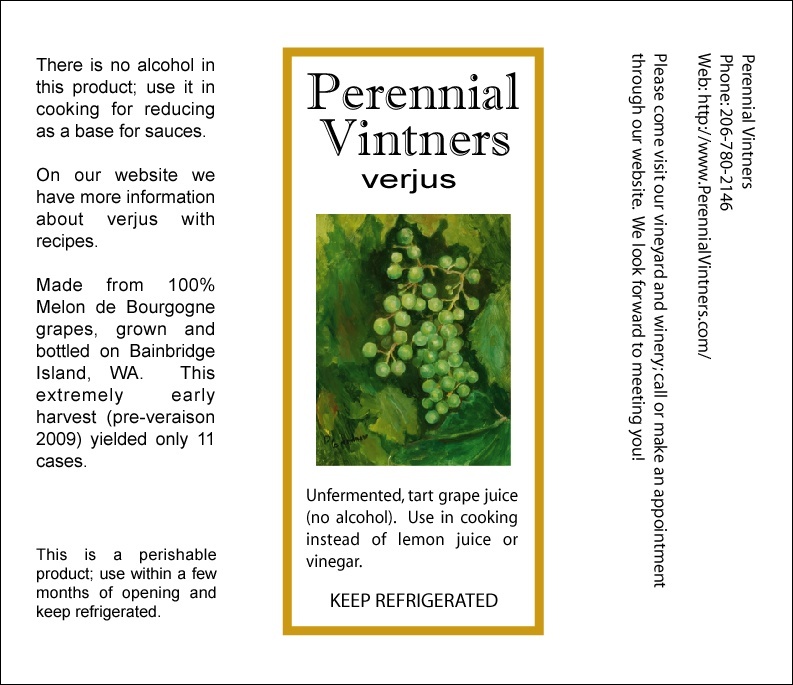 See the Recipes page of our website, and/or go to your favorite web search engine, and look for "verjus" and you'll find many great uses for it. Why are we making a Verjus? You may wonder why one would harvest the grapes before they're ripe? Good question -- this is done when the grapevine is producing more clusters than the viticulurist feels it can properly ripen. By dropping some of the fruit, the vines resources will not be spread as thin, thus it will ripen the remaining fruit more quickly. This can be very important in a cool climate like ours where harvest decisions can be forced by inclement weather. This practice is also often done in warmer areas, however recent studies have shown it has little overall effect when the ripening season is not limited. 2010 was a ridiculously cool growing season -- the coolest on record. Put simply, it never warmed up. The few warmer days were often followed up immediately by rain, which reduces the effectiveness of sprays for powdery mildew and botrytis. Additionally, most of the plants are still quite young and may not be able to support such a large crop. Our green harvest was a little before veraison, meaning that there is no sugar, thus it is seriously tart. Our label is a commissioned artwork. Please visit our page with more information about Dianne Gardner of Port Orchard who painted this lovely cluster of underripe winegrapes, ready to be made into verjus.